Last month we moved Market Street south to our beautiful winter farm in Wellington. I've been busy teaching my regular and ship in students. I had a lot of fun working with Eventer, William Coleman and some of his students. I was Chef d'equipe for Team White at the George Morris Horsemastership Clinic's Nations Cup competition in Wellington. My team members were Katherine Strauss, Eve Jobs, Danielle Roskens and Victoria Colvin. Conrad Homfeld set a very challenging course with a snug time allowed. I walked the course early in the morning with my team. We made a plan for each horse. Then I helped each one at the warm up jumps. Laura Kraut commented on each round, which was extremely educational for everyone to hear. I gave each of them a few pointers to work on after round 1. All of them improved their 2nd round, making a few minor changes. That is what is such fun to help with. We came back tied for 2nd and they improved their scores to take the lead!!! Katherine Strauss led the way with a double clear, on her green horse! Eve Jobs really improved her position and was clear until the last fence on round 2. Danielle Roskens got The Most Improved award from Laura! She and her borrowed horse looked like a new entry in round 2! Victoria Colvin changed her ride at the end of the course and had an unlucky fence down. But it was what we needed to win! 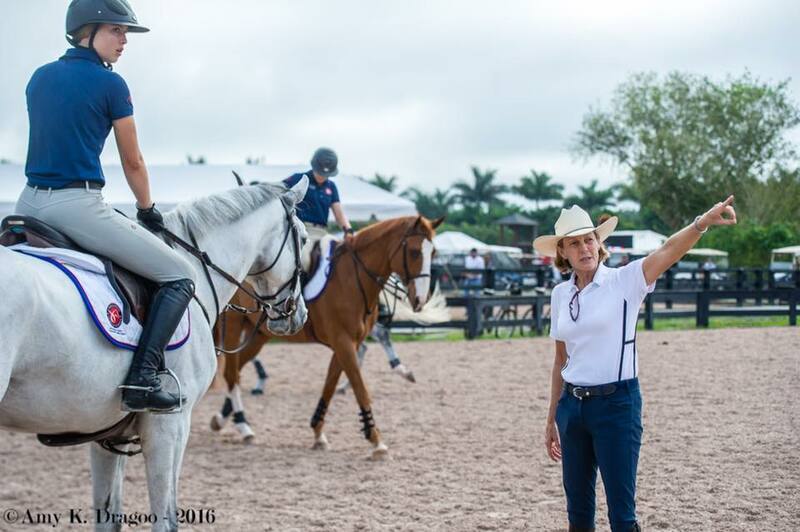 This George Morris Horsemastership Program is an unbelievable experience for our US young riders. I'm thankful I could be a part of it this year. 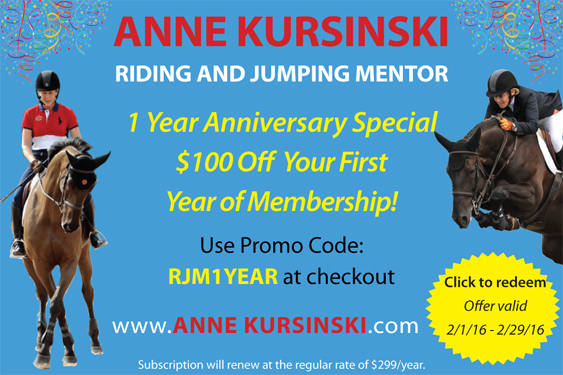 We are celebrating the 1 year anniversary of Riding and Jumping Mentor! 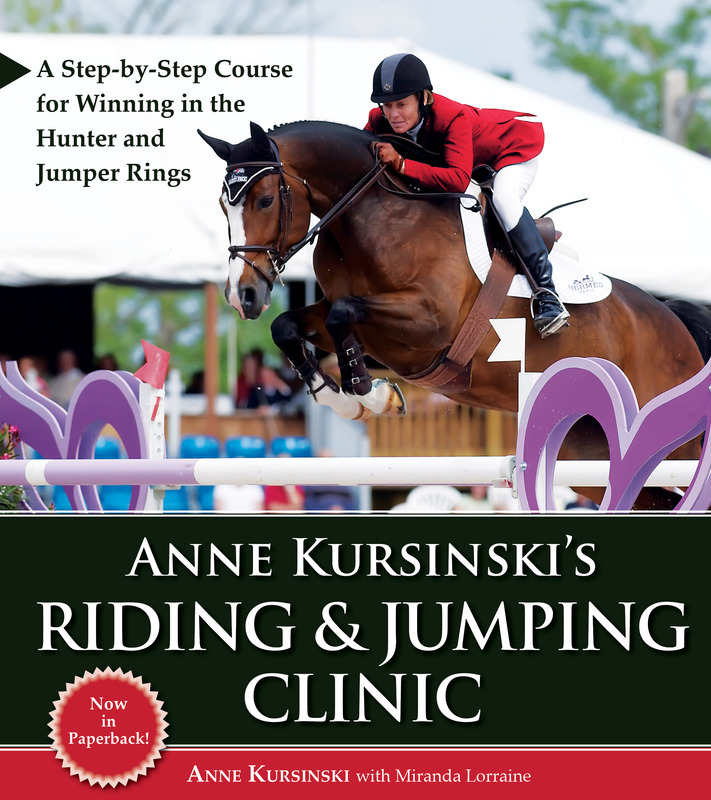 As a special gift to you and your horse, I am giving you $100 off your first year of Riding and Jumping Membership. You've already experienced the fact that bending your horse comes more from the influence of your seat and legs than from your hands. His motion is created from behind and travels forward; your legs urge him to produce pace, rhythm, and impulsion, and your hands "receive" that impulsion and keep it constant as they go forward and back in rhythm with his head and neck movement. In asking for lateral movement, your hands work together as a unit, as they did in the turn on the haunches. They contain and organize your horse’s energy but never pull back on the mouth, never drag the head in or down. Think of what you want to do as "resisting forward." 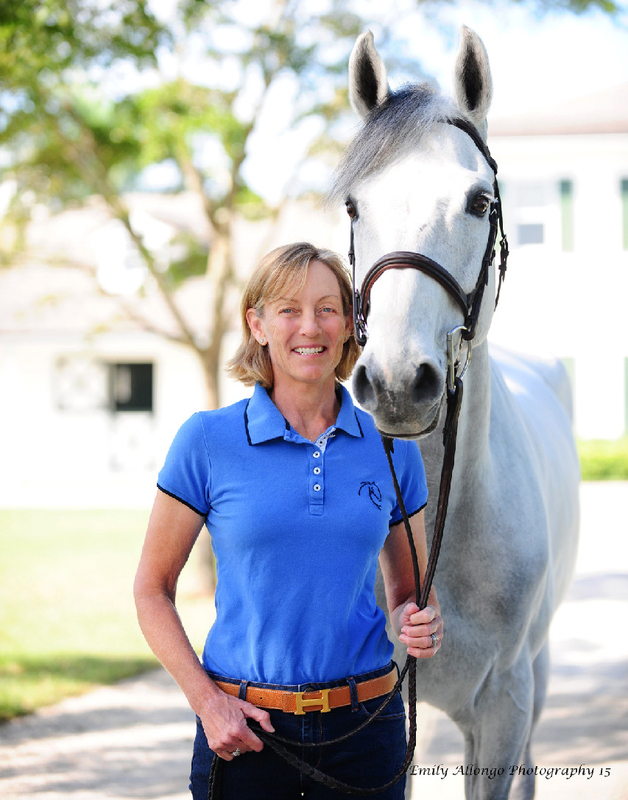 The elements of control you'll work on in the following figures are the same ones you'll rely on for all your turns -wide or narrow, on hunter and jumper courses, or around dressage rings. Before you begin riding a circle (or any of the figures in the rest of this section on basic flat work), visualize how the figure should look. If you're going to ride a circle, visualize a round shape -not an oval egg - that brings you back to the track at the precise place where you left it. Once you know where you’re going, you can begin. Keeping them at the five-inch-apart distance, shift both your hands slightly to what will be the inside of the circle (without increasing pressure). Your inside direct rein tells your horse to turn onto the track of the circle, while the outside rein comes against his neck to support his outside shoulder. Moving both hands together keeps your contact on both sides of his mouth equal and prevents your pulling his head in too much. The movement of my hands is slight, just enough that the inside rein becomes a direct rein slightly off the neck. When your horse is correctly bent, you should just see the corner of his inside eye. The bend will bring your inside rein slightly away from his neck and the outside rein against it, so that the neck "fills out" the outside rein. 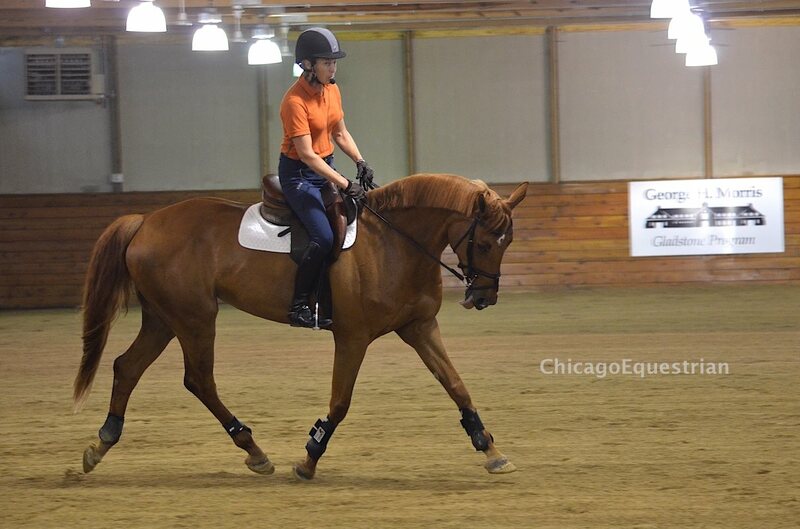 Rhythmically squeeze your inside leg against the girth in time with the forward step of your horse's inside hind. The pressure, slightly greater than you'd use to send him forward in the gait, tells him to bend around the leg, not to fall in, and puts him onto the outside rein. You're asking him to bend, nose to tail, just enough to conform to the track of the circle he's on. Your outside leg belongs a little behind the girth to keep the haunches from swinging out. Use only as much pressure against him as he’s using against you. If there's no pressure from him, keep your leg passively resting on his side, ready at any moment to become active. You're applying your aids correctly when your horse stays on the track you want, giving you the size circle you visualized and the feeling that he’s going where you want him to. If your horse falls off the circle to the outside, you need more outside leg behind the girth and outside rein pressure against the neck. Move both hands more to the inside ( but not across the crest) . Make sure you're not hanging on the inside rein, which would make your horse’s neck bulge out still more. If he leans in, you need more inside leg to keep him from falling in -not more inside rein. If he speeds up, apply a half-halt, taking his mouth a little more strongly with both reins, in rhythm with his inside hind leg, until you feel him slow. Then continue as before. If he slows down, add leg-but either speeding up or slowing down, remember that you are responsible for the rhythm of the gait and the length of stride. Choose 4 mph, or 6, or 8, but stay consistent. 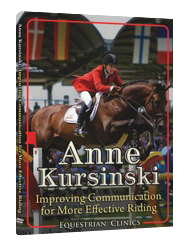 Want to become a better rider? Join Riding and Jumping Mentor today! Click Here to Purchase the Anniversary Special $199 for 1 Year Membership Offer! Use Promo Code: RJM1YEAR at checkout. Subscription will renew at the regular rate of $299/year. Cancel anytime.